Why does the turtle cross the road? 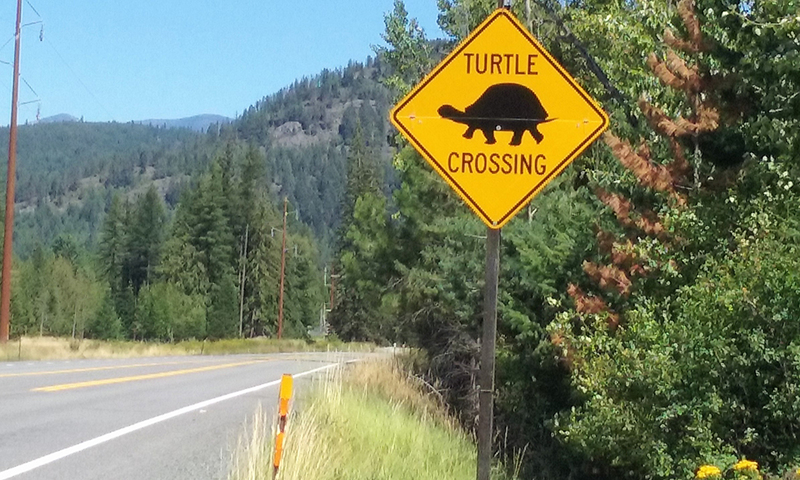 As you may remember last year, turtle crossing signs were put up on the Pack River bridge area on Hwy 200. After 25 emails, an Idaho Fish and Game study and lots of assistance from caring people, they were put up last July. 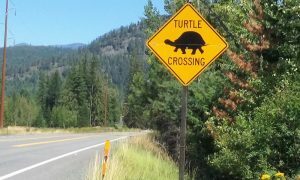 The turtle crossing sign, now missing due to thieves. Photo by Cynthia Mason. Regrettably, someone has stolen both of them; the one west of the Pack River bridge, and the one east of the Pack River bridge. The thieves have state property and if anyone knows you have it, I hope they turn you in. The turtles can look like rocks in the road if you’re not aware they cross the road in this area. The signs served as a “heads up” so motorists could be watchful of them. They can’t try to run away and dodge your moving vehicle like most animals (obviously). So why do turtles cross the road? They live in the water, but lay their eggs in the mud or sandy shoulders of roads. If you spot a turtle on the road and can safely help them, here is how you handle these little western painted turtles. You can carry them by their shell by holding it with both hands on the edges in the middle where the little claws can’t reach you. If you can tell which direction they are traveling carry it towards that side of the road and well away from traffic.